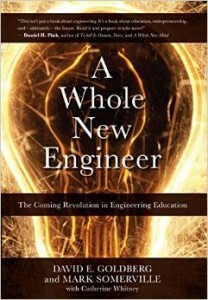 In a lively discussion of how to best prepare today’s engineering students for tomorrow’s engineering challenges, we talk with Dave Goldberg and Catherine Whitney about their new book, A Whole New Engineer. Any “dot-com” dreams that Brian harbored during his college days have long since dissipated. Carmen suggests that ridiculous buyout amounts are now measured in units of “Instagrams,” with one Instagram equaling one billion US dollars. Engineers must constantly expand and refine their skills; Jeff notes that over his career he has moved from drawing prints on a drafting board, to working with 2D CAD packages, to implementing 3D models. Our first guest for this episode is Dave Goldberg, who appeared previously on Episode 37, in which he talked with us about the evolution of engineering roles over time. Dave leads ThreeJoy Associates, a consulting firm that advises educational institutions. Our second guest is Catherine Whitney, a New York-based writer who has previously written or co-written more than forty books on a wide range of topics, including nutrition, social issues, and entrepreneurial success. Dave argues that the “old engineer” was entirely appropriate in a time of expertise and narrow technical focus. However, a “new engineer” must reach across disciplinary boundaries, and solve problems in domains that lack recognized experts. Domenico Grasso has written about the importance of taking a holistic approach to engineering education and practice. Dave makes a passing reference to disruptive innovation, a term coined by Clayton Christensen to describe the manner in which existing markets and institutions may be displaced through the introduction of new technologies. Current technological trends have led to people “bowling alone,” a phrase the describes how individuals are disengaging from the social and political networks that comprise local communities. Richard Feynman’s physics lectures are mentioned by Dave. The story of Jack Andraka is offered as an example of how academic expertise is being undermined over time. Jeff notes differences between “just-in-time” and “just-in-case” learning. Dave notes that more than one version of the Grinter Report (pdf) was proposed back in the mid-1950s. Our guests mention a study by Kristen Wolfe, later referenced by Woodie Flowers of MIT, that looked at the skills used by mechanical engineers five years after they graduated from college. Carmen references one of his favorite books, The Art and Science of Analog Circuit Design, by Jim Williams. An engineering leadership program at the University of Texas El-Paso is cited by Dave as an example of aspiration-specific education. Fernando Flores has written about the power of words in motivating action and establishing commitments. Dave was involved in establishing iFoundry at the University of Illinois, while co-author Mark Somerville was (and is) a faculty member at Olin College. References are made to Daniel Pink’s book Drive, and to Edward Deci’s work on intrinsic motivation (one example of which is his book Why We Do What We Do: Understanding Self-Motivation. A TED talk by Sugata Mitra describes how Indian children were able to teach themselves when provided nothing more than a computer. Harvard University’s Eric Mazur has championed the concept of peer instruction, in which college students teach one another. Dave introduces us to the concept of Junior Enterprise, a student-led consulting firm. In the coaching world, there exists the notion of polarity management, in which distinctions are made between problems and unsolvable paradoxes. Big Beacon is a social movement for transforming engineering education. More information about the book can be found at wholenewengineer.org. Catherine can be reached via email: catherinewhitney -=+ at +=- mac.com. Listeners can contact Dave via email: deg -=+ at +=- bigbeacon.org. He is also active on Twitter and Facebook. Finally, one can follow the happenings at Big Beacon via their website, on Twitter, or on Facebook. Thanks to Dave Goldberg and Mark Somerville for use of their book cover image. Podcast theme music by Paul Stevenson. a younger listener here(16 years old), ever since i can remember i wanted to be an engineer ever since i can remember. I live in Serbia and here we have highschools specialized in engineering (‘Murica might have them too, i don’t know anything about your education system) i got into automatization since it required the least grades from middle school, my grades now are pretty good, but the engineering universities here require almost perfect scores for the government to pay for your education, being from a relatively poor family i couldn’t pay for it and there are pretty much no jobs in Serbia for me to do to get the money . Do you think that i will ever get into the industry? Sorry for the grammar and spelling. Love your show! Glad you enjoy the podcast, Ivan. There are many routes into the engineering profession, although getting an engineering degree is the most direct path. Are there any local engineering or technical firms you could work for? Even if you start by sweeping floors or entering computer data, at least you would be exposed to engineering activities. Are there any Serbian engineers who have suggestions for Ivan? I am currently reading this book and I like many of the ideas I see. However, as I come by my education by a “non-traditional” route I am interested in “how” the ideas championed by your guests might integrate into the community-college pre-engineering program –> small state university engineering program bootstrap pathway to professional practice. From what I’ve read there seems to be a great deal of talk on the “Freshman Experience” and I can’t help but wonder how this itself might be somewhat out of step with the times. The Great Recession has caused many deep and unsettling economic changes and I am concerned that the poorer, “less worthy” (Sub 1500 SAT score) students are being left out of the analysis. I attend a community college that offers both “vocational” technical/shop classes (Welding and Industrial Electrical in my case) and Pre-engineering courses and I am the only student I know who attends both programs. It is with this in mind I am a bit bemused and perhaps somewhat chagrined by all the self-adulation and backslapping at the idea of re-introducing “practical” skills into the curriculum. The infrastructure for this re-introduction, and to the student-masses no less, is in place — and has been in place — for a very long long time. I am deeply concerned by the apparent lack of recognition of this existing resource, student-population and framework by the authors. Again my concern here is for those engineering students who don’t class well enough (or have enough family money or privilege) to go to either a large university like Illinois University or the Ivy league or Olin. Where do these, “other” talented and resilient, individuals fit in the changing world of engineering? Consider this my 2-cent formal-request for the podcast to spend an episode exploring the future for those taking the community college to affordable small in-state school route to the profession. I just found this blog and I’m glad I did. I enjoy getting real time perspective from the industry I hope to join. I too am currently a pre-engineering student at a community college who already has a degree in a different major. I would love to hear more feedback on the non-traditional student who wants to be an Engineer.